Are you a photographer seeking an exceptional backpack? Whether it’s travel, landscape, wedding, or event photography, the Lowepro Pro Trekker 450 AW Camera Backpack offers a variety of options coupled with top-notch quality. Field tested and thoroughly reviewed, learn firsthand details and decide if the Pro Trekker meets your demands. Initial impression of the Lowepro Pro Trekker 450 AW Camera Backpack. 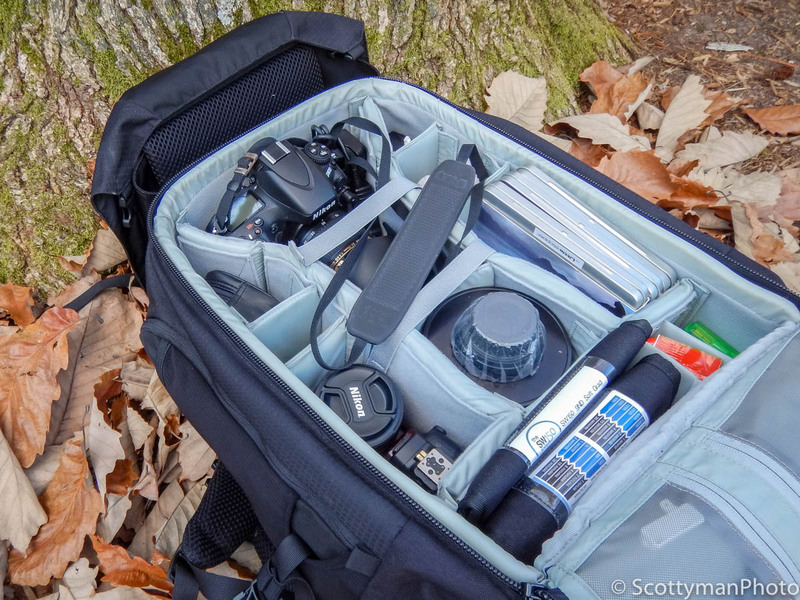 Although I certainly recommend reading the entire article, I will say upfront that the Lowepro Pro Trekker 450 AW Camera Backpack delivers a serious combination of versatility and quality. As a landscape photographer, I frequently hike to arduous locations while carrying a fair amount of gear. Consequently, my circumstances require a backpack with large carrying capacity and extreme durability. Before selecting the Pro Trekker, I painstakingly evaluated several packs; however, after an exhausting comparison, the Pro Trekker prevailed! Indeed, like all backpacks, the Pro Trekker has its pros and cons. Although it’s impossible to satisfy the needs of every photographer with one bag, if you’re in the market for a quality backpack with adequate versatility, look no further than Lowepro’s Pro Trekker. 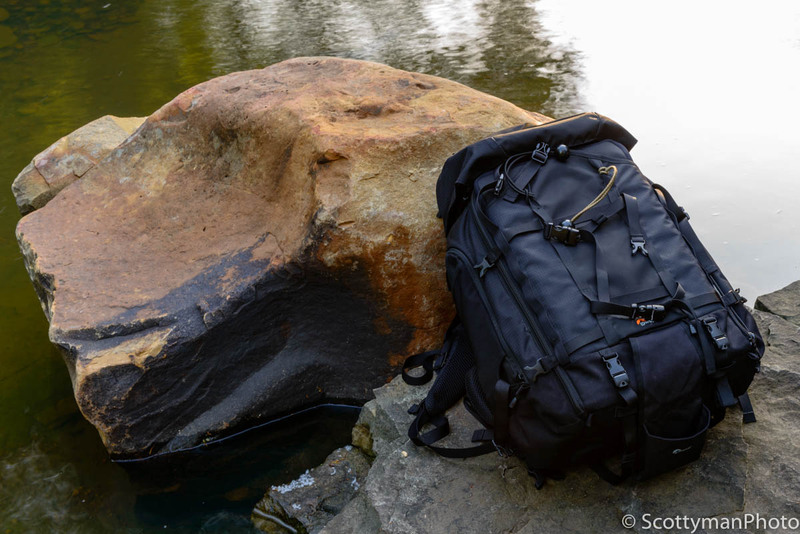 What type of photographer is best suited for the Lowepro Pro Trekker 450 AW Camera Backpack? Honestly, it’s difficult to determine the type of photographer that is best suited for this backpack. In fact, some photographers merely choose a backpack to store and protect gear while others favor mobility. Truly, placing gear on a shelve is certainly more economical and makes perfect sense for studio work. Regardless, I feel the Pro Trekker appears best suited for photographers that require mobility and security while carrying a considerable amount of gear. Whatever the reason, e.g., hiking, weddings, or storage, the Lowepro Pro Trekker 450 AW Camera Backpack can accommodate almost any photographer. How much gear will it carry? No doubt, the Pro Trekker supports a great deal of weight. However, the critical question is not how much it can carry, but rather how much you can carry. As for myself, I can comfortably carry a full frame DSLR with an attached battery grip, two to three lenses, and a variety of accessories, including a seven-pound tripod. In addition to the interior contents of the bag, the Duraflex D-rings provides an option for tethering external items, especially bulky items such as a tent or hammock. Indeed, hauling this fully loaded backpack to the summit of Cloud Splitter required all the energy I could muster. Nevertheless, having planned an early arrival, I had everything needed to enjoy the day and later capture the sunset. On the trail, the Pro Trekker offers excellent protection while affording additional space to accommodate a variety of accessories and other essentials for extended excursions. An evening view from the summit of Cloud Splitter in Frenchburg Kentucky. 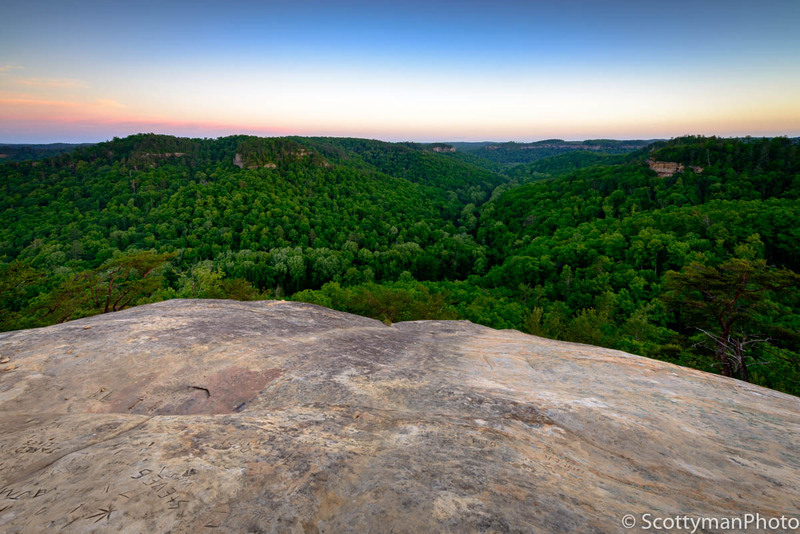 Reaching approximately 1100 feet in height, the summit rewards its visitors with a stunning view of the Daniel Boone National Forest. How versatile is the Pro Trekker? Like many camera backpacks, the Pro Trekker utilizes a hook and loop material, commonly referred to as velcro, to secure the compartment separators. 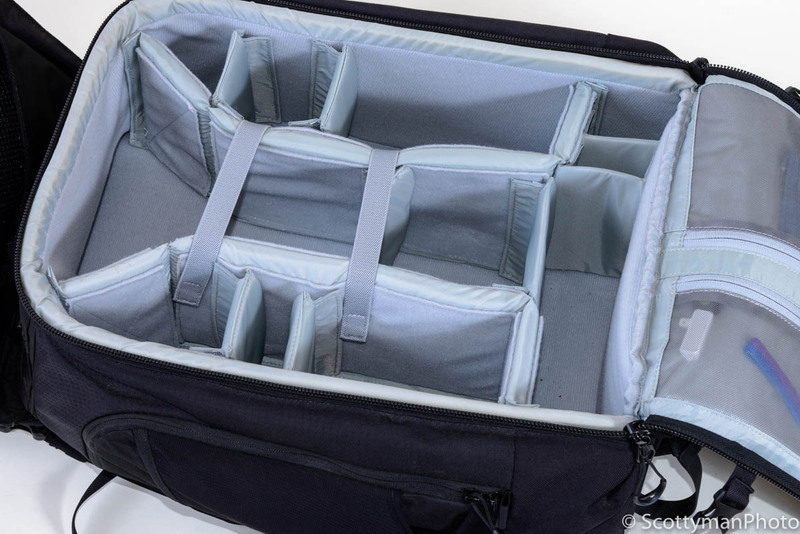 Lowepro’s MaxFit System consists of adjustable padded dividers that are easily maneuvered to accommodate a wide variety of camera or video gear. Primarily used to secure and protect a camera body and lens, the main camera section consists of two removable and adjustable padded dividers. Combined with the use of velcro and two flexible joints, the padded dividers afford easy customization while rendering extra security with three points of contact to the frame of the backpack. Furthermore, the Pro Trekker has eight reenforced miniature dividers which allow further customization of compartments to accommodate a plethora of accessories. What about ease of use and access to gear? Unquestionably, designing a camera backpack to satisfy the needs of every photographer poses a monumental challenge! Although I feel the Lowepro Pro Trekker 450 AW Camera Backpack comes close to perfection, it could certainly benefit from a few improvements. 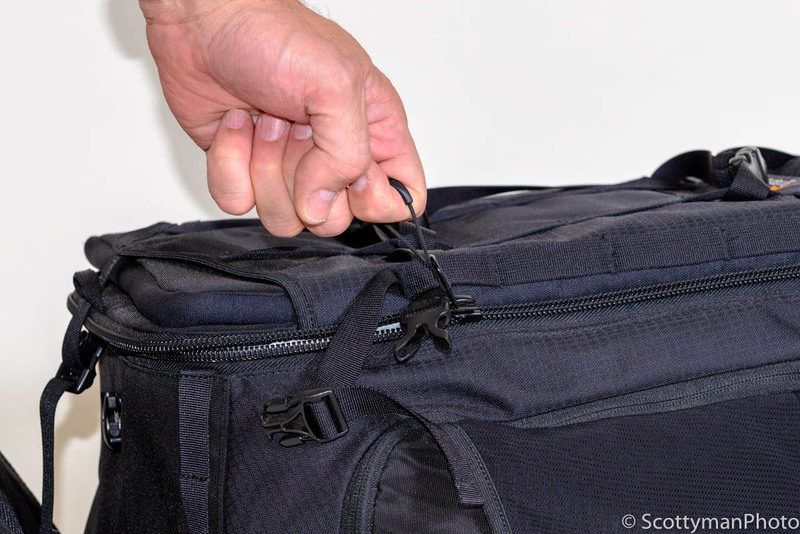 For example, the Pro Trekker’s main compartment uses a heavy-duty zipper with five securing straps. Seemingly, the design provides additional security to prevent the contents from dropping out in the event the zipper fails. Although I enjoy the added protection afforded by the straps, they can make accessing gear a bit cumbersome. In fact, with the Pro Trekker lying on its back, gravity takes over, and the straps tend to hang over the edge; thus, the zipper frequently snags during opening and closing. Furthermore, with the backpack lying on its back, access to the two rear storage compartments in the protective lid is a bit awkward. What about the quality of material and construction? Indeed, the Pro Trekker’s superb quality material and superior construction yield great confidence while navigating a rocky trail. Consequently, the Pro Trekker is not the lightest backpack to shoulder. However, after hauling the Pro Trekker through miles of rugged and narrow trails, I can certainly attest to the backpack’s quality construction and durability. In fact, I have dragged my fully loaded Pro Trekker, with an attached tripod, between tight openings in cavern walls. Built to go the distance, I think this backpack will stand the test of time and remain a top contender in the backpack market for the foreseeable future. What about comfort when wearing for extended periods? The Pro Trekker begins with the disadvantage of an empty weight of nine pounds. Nevertheless, most photographers interested in the Pro Trekker probably expect to carry a fair amount of weight. In fact, I often hike to locations packing a full-frame DSLR, two lenses, camp supplies, a tripod, and several other items. 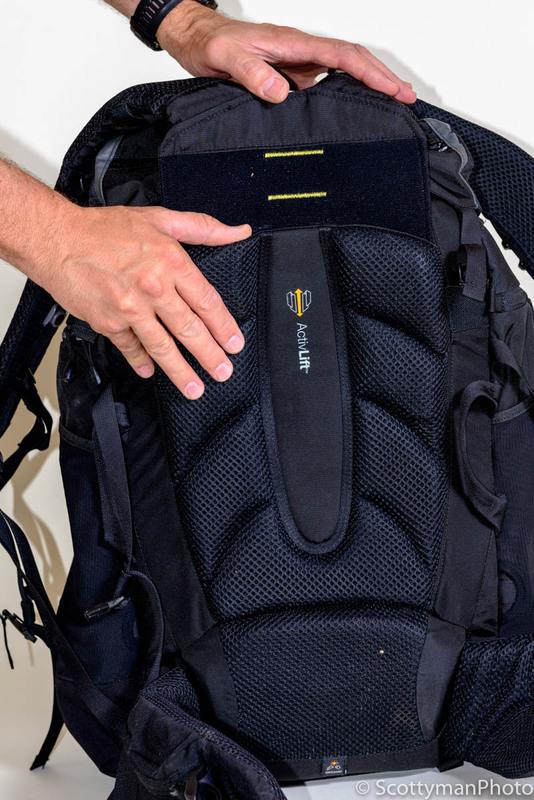 However, as advertised by Lowepro, the ActivLift System Harness performs well in supporting and evenly distributing the weight across my shoulders and waist, not on my back. Additionally, the ActivLift System provides room for adjustment and can accommodate almost any photographer’s body style. As a matter of fact, at the height of six-foot-five, I have no issues with fit or comfort. Above all, the capacity, versatility, and comfort on the trail make the Pro Trekker a prime prospect for any serious photographer, especially landscape and event photographers. Indeed, I consider the seam-sealed hydration pocket one of the most useful features on the backpack. Although one may just as easily carry a bottle of water, my 70 oz Osprey Hydraulics Reservoir stays much cooler in the seam-sealed pocket and is easily accessible without requiring the removal of the backpack. In addition to comfort, the sizeable rubber-coated handle provides a convenient and easy way to hand-carry the bag; very useful when loading and unloading from a vehicle. Lastly, despite the Pro Trekker’s massive empty weight of nine pounds, the protection afforded by the additional padding is well worth the added weight and offers excellent peace of mind when trekking with expensive gear. First and foremost, the quick disconnect straps remain my biggest complaint with the Pro Trekker. In reality, the securing straps offer added peace of mind that certainly outweighs a bit of snagging; still, interference from the straps make operating the main compartment’s zipper a bit tricky. Second, as a landscape photographer, I fail to see the benefit of having a laptop compartment, wasted space in my opinion. However, I’m sure many others, such as wedding and event photographers, find the laptop compartment very useful indeed. Finally, with the backpack positioned on its back, access to the storage compartment in the protective lid is somewhat inconvenient. I prefer the zipper in the front of the compartment for easier access. Does it meet airline standards as carry-on luggage? Nowadays, with almost all airlines charging for checked baggage, everyone wants to hand-carry everything from kitchen sinks to diesel engines. While I do support the free baggage revolution, it does guarantee a full plane with jammed overhead storage and barely any leg room. On the other hand, one may opt out of the baggage Tetris nightmare by merely checking gear. As for myself, the thought of checking equipment is inconceivable. 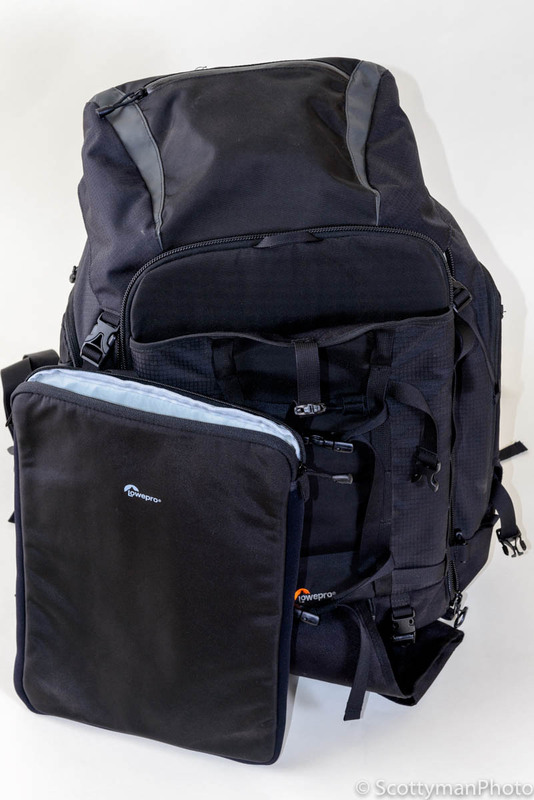 Unfortunately, according to the carry-on size chart at Travel Made Simple, the Lowepro Pro Trekker 450 AW Camera Backpack exceeds the carry-on standard for all airlines. In fact, the Pro Trekker exceeds carry-on limits even after removing the protective lid. Consequently, with great size comes great inconvenience, at 19 inches in width, I don’t think you’ll be carrying this backpack aboard. Nevertheless, some airlines offer gate-checking, if you’re that daring. Like many purchasing decisions, sometimes justifying the price tag can cause significant anxiety. Despite finding the occasional “good deal,” when it comes to gear, usually, price and quality are directly proportional. Skimping on a bag could cost more in the long-run. Clearly, no one wants to pay for a replacement bag or broken gear, especially during one’s travels. As for myself, quality and durability are the most critical factors when selecting a backpack. Therefore, in my humble opinion, the Pro Trekker is absolutely worth the price. Having said that, I recommend B&H Photo due to their excellent pricing and superior customer service. Although the Pro Trekker tends to hold its value quite well, locating a used bag on eBay may save a few dollars. Extreme padding provides excellent protection. 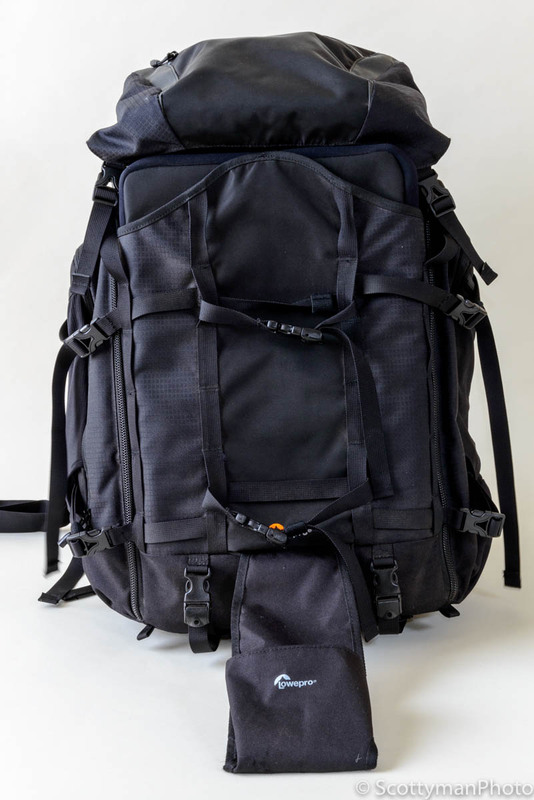 Large capacity, an excellent option for hiking with camera gear and provisions. May reduce theft by not overtly advertising camera names on the backpack, e.g., Nikon or Canon logo. Superior construction and quality material. Heavily padded hook and loop “velcro” dividers allow for easy access and customization. 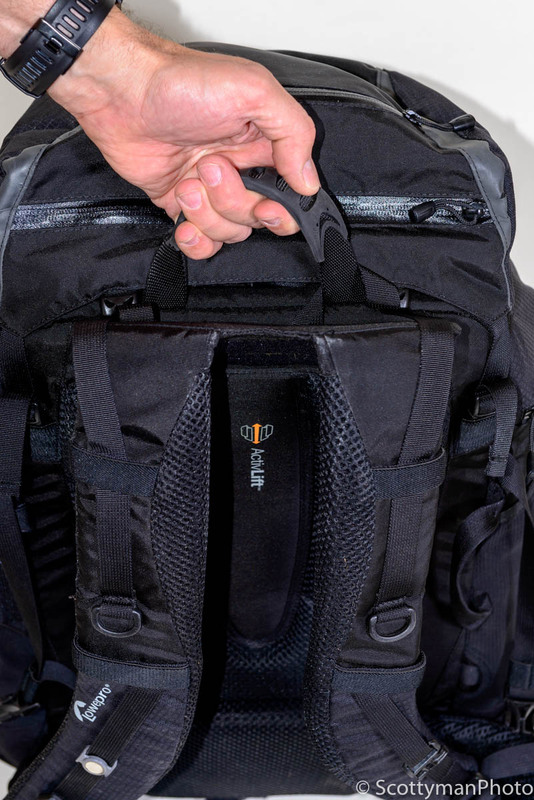 External pockets and Duraflex D-rings are convenient for securing additional items. 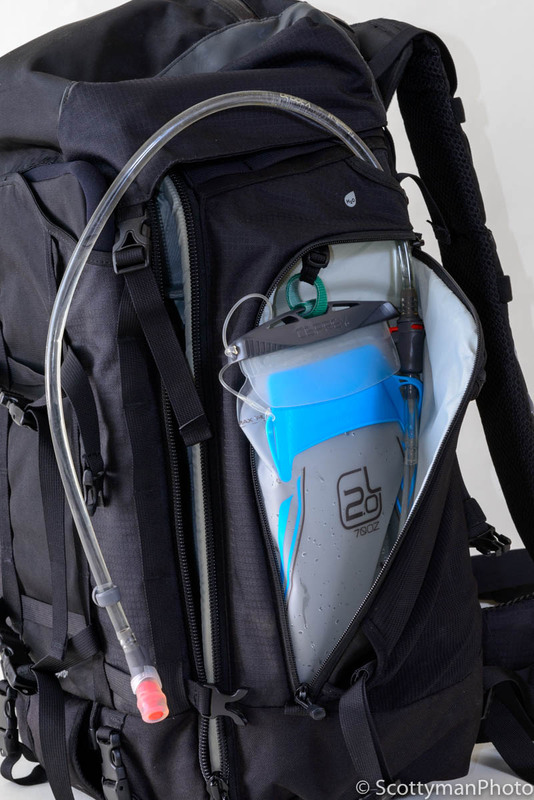 Capable of carrying 70 oz of water plus additional bottles in the external mesh pockets. Accommodates large tripods with a sturdy, yet tucked away, tripod holder. 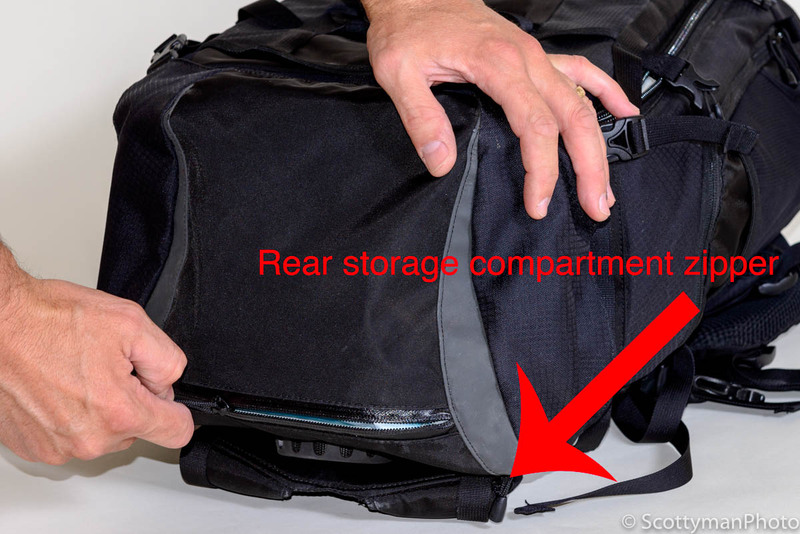 Accessing the main compartment requires unclipping five buckles followed by unzipping. 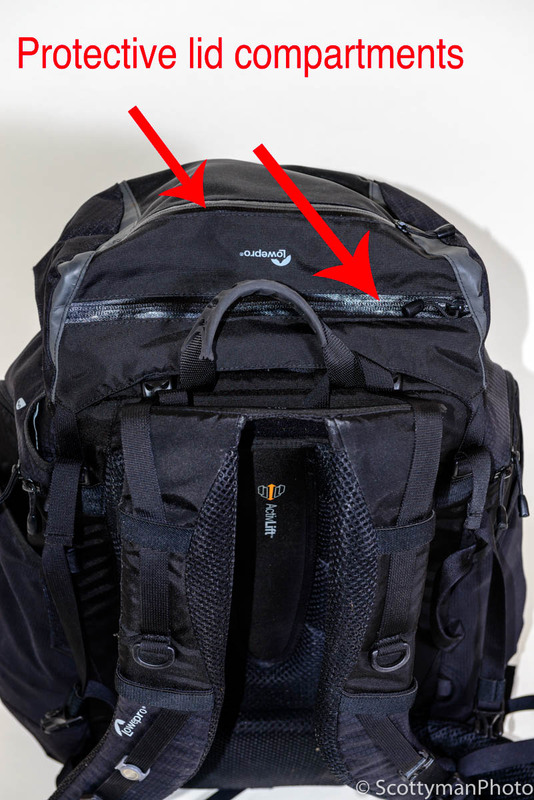 The main compartment’s zipper occasionally snags on the securing straps. Inconvenient access to the protective lid compartment. Not surprisingly, the more exposure one has with a product, the easier it seems to identify flaws. However, after owning this backpack over one year, I remain delighted with its performance. Quality construction coupled with versatility and durability encapsulates the Pro Trekker. Whether landscape, wedding, or event photography, this backpack will likely impress even the most finicky photographer. Truthfully, If I were in the market for a similar pack today, I would no doubt select the Lowepro Pro Trekker 450 AW Camera Backpack, yet again.